Saturday: Increasing clouds. Highs in the 50s. Saturday night: Wintry mix arrives. Lows in the 20s and 30s. Out of the two weekend days, today is the better of the two for outdoor plans. High temperatures today are expected to stretch into the mid-50s for southern New England, 40s north under partly cloudy skies. We’ll have a few rain showers along the immediate coastline of southern New England, but that’s expected around dinner time. The showers are the leading edge of a system that will bring a messy mix of wintry precipitation to the region for Sunday morning as colder air slides in. Clouds thicken this evening and through the overnight ahead of the system that’s currently traversing Pennsylvania, the Ohio Valley, and St. Louis. As the system slides into southwestern New England in the pre-dawn hours of Sunday morning, the rain/snow line sets up along the Connecticut/western Massachusetts border, before Connecticut changes over to just rain. The Berkshires, higher elevations of western and central Massachusetts are expected to start off as snow, then change quickly to a wintry mix to freezing rain, which is why a Winter Weather Advisory has been posted for west and central Massachusetts, northern Connecticut, and southern Vermont where ice accumulation will have the greatest impact. By 9 a.m., the rain/snow line will be hovering over or slightly north of the Massachusetts Turnpike. Areas south will be under rain. Areas north, wet snowflakes continue to advance northward into northern New Hampshire, and the leading edge of snow showers slide into interior Maine. By the late afternoon, early evening hours, the rain/snow line will continue to lift northward into southern Vermont, southern New Hampshire, and southern Maine, as rain showers become scattered for southwestern New England. By midnight, most of the precipitation will be out of here besides lingering snow showers for interior Maine, and rain at the immediate coastline. Snowfall totals range from 1-3 inches for southern New Hampshire, southern Vermont, and coastal Maine. 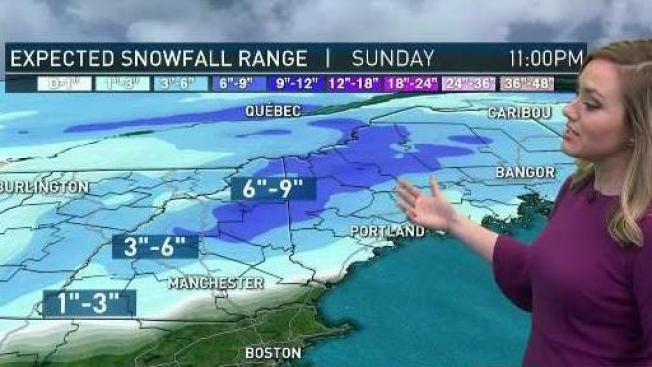 Three-six inches is expected in the higher elevations of northern New England, and 6-9 inches of snow is expected in the higher elevations of northern New Hampshire and interior northwestern Maine. High temperatures for Sunday will be drastically different from today with highs expected in the upper 30s south, low 30s north. The system heads out to sea and drags the cloud cover with it, making for a pleasant start to the work week and the return to mild, 50-degree weather. Monday through Wednesday brings highs near 50, with Thursday ushering in a cool down as we turn the calendar to a new month. In the extended forecast, the first full weekend of March, Friday brings a system that stretches into Saturday, which could bring blustery conditions, along with accumulating snow north, and heavy rain south, but the track and duration could change as we get closer, so be sure to stay tuned for the very latest updates to the forecast over the course of the week.